Looking to buy a midsize sedan in the Merrillville area? Visit us here at Bosak Honda in Michigan City to take a used Honda Accord for a test drive! The Accord is spacious, safe, efficient, and fully featured – everything you could want in a family sedan, plus a whole lot more. 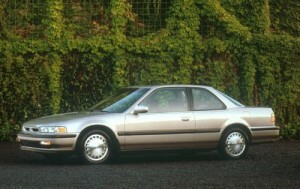 Standard in most used Accord models is a 2.4L four-cylinder engine. Recent models can produce an EPA-estimated 27 mpg in the city, 36 mpg on the highway, and 30 mpg combined. Earlier models deliver 23 mpg in the city and 34 mpg on the highway, which is still very good for a midsize sedan. With the available 3.5L V6, you can expect to get about 20 mpg in the city and 30 mpg on the highway. Many fuel-efficient sedans compromise performance for efficiency, but the Accord excels at both. With 0-to-60 times as short as 6.1 seconds, you can pass and merge with confidence. Feature availability varies between models, but you can be sure that you’ll be getting lots of great stuff for a reasonable price when you buy a used Accord. Even some earlier models come with features like lightweight alloy wheels, sunroof, CD player, automatic climate control, and leather upholstery. Get a more recent model, and you’ll see standard features like an 8-inch infotainment display, Bluetooth connectivity, iPod-compatible sound system, and a rearview camera. The Honda Accord also has some of the most advanced safety technology of any vehicle in its class. It has consistently earned a perfect five-star score from the NHTSA, as well as earning a top rating of “Good” for most tests conducted by the IIHS. Test Drive a Used Honda Accord Today! Ready to find the used car that’s perfect for you? You’ll find a variety of quality used cars to choose from here at Bosak Honda near Merrillville! See which models are currently in stock by checking out our online inventory page, or give us a call at (800) 728-9825 for more information. Our helpful sales team can help you find a great used car that fits your budget!